These tools are now standard across the translation industry and as a client of any language services provider, you should be aware of this technology and the benefits it provides in terms of speed of service, cost reduction, quality and consistency. By using computer aided translation tools (CAT) we find repetition of sentences in your documents. This means we translate these sentences once only, saving both time and money. Then for your next publication? We’ll cut your costs again by utilising what we have already translated in the first project. Over time, as we work with you, we will build up a comprehensive database of translated sentences specifically for your publications. 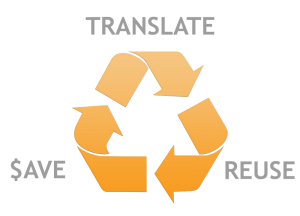 This Translation Memory enable us to provide you with enhanced consistency of terms in your publications whilst at the same time providing you with value for money and the highest levels of quality. At Foreign Language Services we are committed to our clients being in control of their own translation memory databases. At any time you can request your translation memory databases. We will never tie you in or hold you to ransom because we are confident that our superior customer service, fair pricing and attention to detail will keep you coming back to us again and again.